An owner of a Startup has been having problems pushing his product out for over a year. He believed his product was innovative, revolutionary and will be a commercial success provided his marketing is right and the business is given the time it desperately needed to succeed. He complained that his investors are putting pressure for returns and have even dared to suggest a change in direction. They believe the product is good but the market is not ready. But is that true all the time? 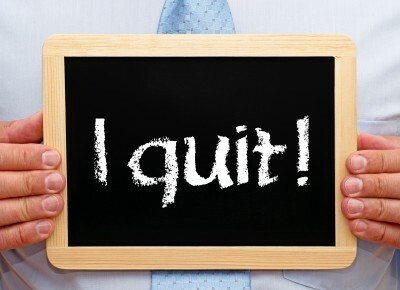 Is quitting such a bad thing? Is failure that deplorable and do quitters really never win? These are questions I sought to address especially as so many young Nigerians face the prospect of setting out on a new career path or a new business venture. How exactly does one quit to win? There is enough evidence online of successful people who have quit so many times on their way to changing the world we live in. Their willingness to quit a comfort zone for the unknown has made them billionaires and so successful one wonder’s what life would have been had they not quit. Having read so many of their stories, a clear and consistent pattern does emerge. The commonest reason why people refuse to quit is the pain of letting go after so much time and money have been invested in getting things to work. The sacrifices, progress made so far (even if it leads to nowhere) and lessons learnt are all too hard to relinquish. Economists call of this the sunk cost and one defined it as a “maladaptive economic behavior that is manifested in a greater tendency o continue to endeavor once an investment in money, time and effort has been made.” It’s the reason why a Chief Executive of a business or its owner will continue to stick to a bad business model even though evidence suggest it just isn’t working. It is also why Government embarks on white elephant projects that they know is doomed to fail but still push through for fear of not having to appear wasteful if they decide to botch. It is also why prostitutes find it hard to quit even when presented with better options. Research, ironically shows that opportunity cost rather than sunk cost is what decision makers should actually be focused on. Opportunity cost within this context is defined as the cost of ignoring a possible viable path to success for fear of quitting the current path. So far we continue to hold on to a cost that is sunk and not productive we loose the benefits of embarking on better ideas that may lead to quicker and more positive results. So when then should one quit? Quitting When the ovation is loudest is a peculiar reason most successful winners quit. They identify that they have attained the pinnacle of their endeavor and quit to allow for fresher ideas and leadership. An ex Bank Managing Director who quit after ten years on top, once informed employees of his new organisation that quitting was perhaps the best decision he ever made. By quitting, his eyes were suddenly opened to new business and ideas that continue to transform the lives of Nigerians and Africans in general. Another reason is quitting when repeated actions do not lead to a desired result. You keep applying the same logic and attitude expecting a different outcome. Experience has shown sticking to dogmatic principles does not necessarily produce economic benefits. In fact it is even more synonymous with failure. As the saying goes, you can take a camel to the river but can’t force it to drink. Quitting when input no longer translates to maximum output is a plausible cause of action to undertake when faced with an economic decision. You cannot continue to rely on past glory when your best efforts continue to produce diminished returns. Why continue to invest in the same promotional and marketing technique even though sales are dropping and inventory is piling up? Quitting when the fear of failure no more exist is a common character trait of most people who have delivered success where no one though it was possible. It takes an uncommon ability and self-determination to push on to conquer fear. There was a story of a lady who said her dad rewarded her every time she told him she had failed at a new venture. Her Dad believed early enough that the greatest gift he could offer her was the ability to conquer fear. She was recently named as one of the youngest self made billionaires in the world. The owner of the Startup did stand by his words to buyout his investors despite poor sales. Fortunately, he ended up being the only one on the loosing side.